The 3 x MPU 6050 breakout boards (GY521) I ordered on Alibaba arrived from China yesterday. I’m looking at using a device which has both an accelerometer & gyroscope in one package rather than an IMU assembled from several discrete devices to make the software simpler (only one I2C bus address). To make the Microsoft I2C implementation work with multiple discrete devices usually requires a layer of abstraction like commonly used AbstractI2CDevice class which I was wanting to avoid in this project. The test rig for my light weight high performance driver, a netduino 2 plus & breakout board. If I need a compass to make the Quadcopter controller work I’ll upgrade to an MPU 9150. 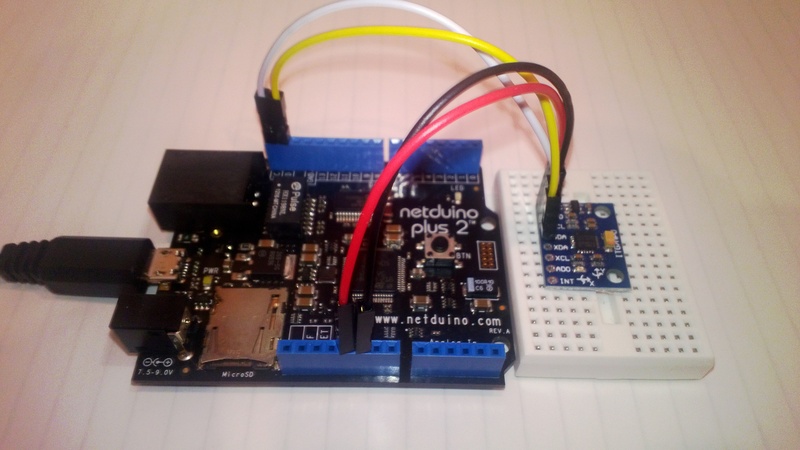 This entry was posted in .NetMF, Netduino, Quadcopter and tagged accelerometer, gyroscope, imu, MPU6050, Netduino, quadcopter. Bookmark the permalink.